Project obstacles and solutions: As an initiative to open up bottlenecked traffic flows, the Indiana Department of Transportation (INDOT) announced plans for their Operation Indy Commute. One area of emphasis in the plan was alleviating traffic congestion at the intersection of I-465 and I-65 on the south side of Indianapolis. Their plans called for a new two-lane flyover bridge to replace a single-lane cloverleaf ramp from westbound I-465 to southbound I-65. It also reconfigured the I-465 eastbound to I-65 southbound ramp to work with the new flyover. The bridge goes up and over 15 lanes of traffic and is 1,400 feet long. Walsh Construction was awarded the contract for this part of the $40 million project. The bridge was constructed with eleven spans between ten cast-in-place hammerhead piers and two abutments. The biggest obstacle in this construction project was contending with the volume of traffic on a daily basis. This is one of the heaviest traveled intersections of two highways in the state. During morning and afternoon rush hours, extra lanes were opened up under the bridge. IMI safety personnel and drivers worked with Walsh to make sure concrete was delivered in a safe manner. 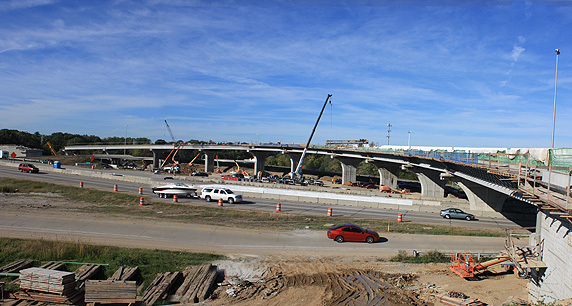 IMI supplied 3,000 yards of concrete for the footings and piers, 300 yards for the bridge rails, and 2,800 yards for the deck. To skirt the mass of traffic that travels the area daily, the largest pours happened during the night. This included all of the concrete poured on the deck. IMI drivers, production, dispatch and sales personnel worked throughout several nights to keep the project moving forward and on schedule.